"The night of my previous show "Life" that I died and reborn, it was Easter night and the night of the new moon. Not any other night for my "Life" afterlife but tonight. Tonight is the night of first full moon since the night of the new moon, the night of special moon. Tonight, the moon would be so close to the Earth, it is "Supermoon" that shines 14% larger and 30% brighter than usual." Yes, it is his "Life 120505". This is a live recording of his live show held on Saturday 5 May 2012. This is the first "Life" since his reborn on 14 April 2012. The show was crowded with audience twice as many than usual, and audience were packed in the venue just as if they were in crowded train during rush hour. The audience experienced the ear-splitting roar at 120dB, this tremendous playing there. Everyone was convinced, that the reborn JINMO is full of energy even more fiercely than before. Of course JINMO played explosively, and he that dared to use wireless for the show, had danced like a dancer fast and violently more than before, and he had burst into jam stuffed audience. There was the audience beaten his head by carbon made Jinmoid. On the verge of ending, JINMO took out a pair of Japanese swords. Then he put a sword into between the fingerboard and strings of Jinmoid and achieved the method of prepared guitar. The appearance of JINMO, was just like a phantom. "Life 120505-1" is 6 minutes 47 seconds of high-speed complex performance of natural overdrive sound in the middle part of the show. "Life 120505-2" is 10 minutes 53 seconds of performance in the distortion sound with abundant harmonic overtone in the final part of the show. This second half is the explosive performance using 2 Japanese swords. Every sound had emitted only by a guitar with JINMO's two arms and 2 Japanese swords. The sound you listen, the explosive performance you feel, it had done by the man who had succeeded barely in 32-meter walking rehabilitation accompanied by a nurse just 2 weeks ago. †It would be big surprise even though you were not there. Please enjoy this record at explosively high volume and share the joy of the fact of his revive. JINMO is certainly revived, and his energy surpasses far the energy of the former JINMO. Following description is JINMO's words in the invitation to the show "Life 120505". 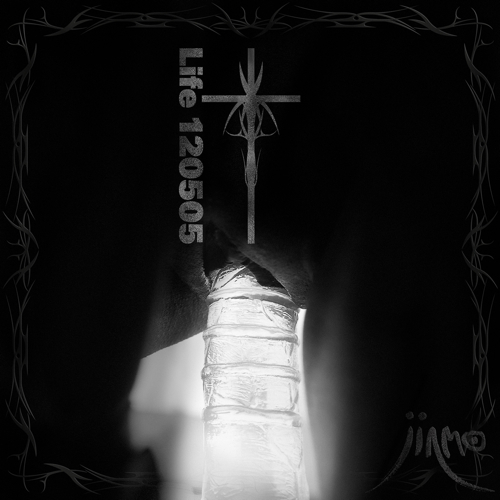 This album "Life 120505" would be the must listen album for all JINMO manias.